Shriners have the fez. Other clubs might have antlers. But the fraternal organization known as the Legionarios del Trabajo of America have an apron, sash and fuzzy velure cap worn tight on the head. If that appeals to you, you're in luck. They're looking for young, new members. And when you pay the $25 initiation fee and $15 annual dues, you'll get the secret password. "If you show me your membership card, I'm willing to give it to you," said Camila Carido, 92, the group's grand dame, who in 1935 was the first woman admitted to the organization in Stockton. Carido and many of the 660 members of the Legionarios are meeting this weekend at the Radisson Hotel Stockton for their 14th triennial convention. They're wondering how long they can keep it up. After 79 years, the organization, which has its roots as a support group for Filipino immigrants to America, finds its numbers dwindling. Members are dying faster than new members are found. And its a double-whammy because the group, a legitimate nonprofit, is a mutual-aid society that gives a $3,500 death benefit to member families. Last year, 55 members died. As they do, the funds dry up. "We're paying out more than we take in," said Zosimo De Veas, 65, who is otherwise known as an illustrious brother and the group's grand master for the past nine years. De Veas, an Internal Revenue Service employee who lives in Hercules, drives to Stockton each weekend to run the organization from its Grand Lodge on South San Joaquin Street. Along with the lodge, the Legionarios own 160 acres of farmland in Lathrop that's currently leased out. "They grow tomatoes," said Ernie Mabalon, 79, the group's supreme minister. At this week's national meeting, some members suggested the group sell the farmland. "Never," said Mabalon. "That was bought with the sweat of the old farm laborers." Those early immigrants were the founders of the Legionarios, and included Filipino labor leaders like Larry Itliong, who some considered Cesar Chavez's right-hand man. 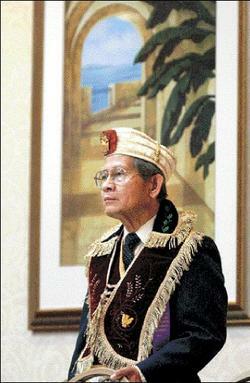 Originally formed in Manila, the Legionarios was seen as the Filipino answer to the Free Masons. The symbols and images are similar but with a heavy dose of Filipino national heroes and Christian ideals. Nevertheless, the group says it is nonsectarian and nondenominational and preaches tolerance. When the group arrived in the United States in 1924, its main purpose was to serve as a social support system to the mostly male Filipino immigrants. The hostile social pressures of the time, which included anti-intermarriage laws, made the Legionarios even more important to the Filipino community. Today, however, the Legionarios are dying off. The one-time national group is down to a few chapters in California and Washington state. Nowadays, a new, young member might be a 60 year-old doctor looking for people to socialize with. "When you try to recruit a 25- to 26-year-old, they just say, 'Oh my God,'" said Felino Cabusora, 75, of Union City. Cabusora joined three years ago for the fellowship, the club's tradition and the death benefit -- which could be reduced if the members keep dying off at a faster rate. "Age and death have caught up with us," Mabalon said. But so have the women. The one-time predominantly male organization is now two-thirds female. "Will we have a woman grand master or mistress?" De Veas asked at Thursday's Ladies Conference Luncheon. Carido, who is the mother of Stockton Vice Mayor Gloria Nomura, was honored at the luncheon and put the group's problem in more-direct terms. "This is the last time to see all of you to give my love," said the 92-year-old. But De Veas is more optimistic. The coronation ball today and the banquet Saturday are open to the public. A big push for new members is planned. And the year's almost over, and there are only 26 deaths. If you join, you'll get the secret password, the sign and the handshake. Until then, don't ask. "We keep it among ourselves," De Veas said. Solar maximum is years past, yet the sun has been remarkably active lately. Is the sunspot cycle broken? NASANovember 12, 2003: Imagine you're in California. It's July, the middle of summer. The sun rises early; bright rays warm the ground. It's a great day to be outside. Then, suddenly, it begins to snow--not just a little flurry, but a swirling blizzard that doesn't stop for two weeks. That's what forecasters call unseasonal weather. It sounds incredible, but "something like that just happened on the sun," says David Hathaway, a solar physicist at NASA's Marshall Space Flight Center. Only a few weeks ago solar activity was low. The face of the sun was nearly blank--"very few sunspots," says Hathaway--and space weather near Earth was mild. "Mild is just what we expect at this point in the 11-year solar cycle," he explains. "The most recent maximum was in 2001, and solar activity has been declining ever since." Then, suddenly, in late October the sun began to behave strangely. Three giant sunspots appeared, each one larger than the planet Jupiter. In California where smoke from wildfires dimmed the sun enough to look straight at it, casual sky watchers were startled by the huge blotches on the sun. One of them, named "sunspot 486," was the biggest in 13 years. Sunspots cause solar flares and, usually, the biggest flares come from the biggest spots. The three giant sunspots unleashed eleven X-class flares in only fourteen days--equaling the total number observed during the previous twelve months. "This was a big surprise," says Hathaway. The effects on Earth were many: Radio blackouts disrupted communications. Solar protons penetrated Earth's upper atmosphere, exposing astronauts and some air travelers to radiation doses equal to a medical chest X-ray. Auroras appeared all over the world--in Florida, Texas, Australia and many other places where they are seldom seen. Researchers rank solar flares according to their x-ray power output. C-flares are the weakest. M-flares are middling-strong. X-flares are the most powerful. Each category has subdivisions: e.g., X1, X2, X3 and so on. A typical X-flare registers X1 or X2. On Nov. 4th, sunspot 486 unleashed an X28 flare--the most powerful ever recorded. "In 1989 a flare about half that strong caused a widespread power blackout in Quebec," recalls Hathaway. Last week's blast was aimed away from Earth, so its effects on our planet were slight--a bit of good luck. All this happened two years after solar maximum, which raises a question: is something wrong with the solar cycle? Is the sun going haywire? "Nothing's wrong," reassures Hathaway. The sun isn't about to explode, nor is the sunspot cycle broken. "These latest sunspots were whoppers," he allows, "but sunspot counts averaged over many weeks are still declining as predicted. We're still on course for a solar minimum in 2006." Indeed, it's possible that what we've just experienced is a normal part of the solar cycle, speculates Hathaway. "There's a curious tendency for the biggest flares to occur after solar maximum--on the downslope toward solar minimum. This has happened during two of the last three solar cycles." Consider the year 1984, says Hathaway. 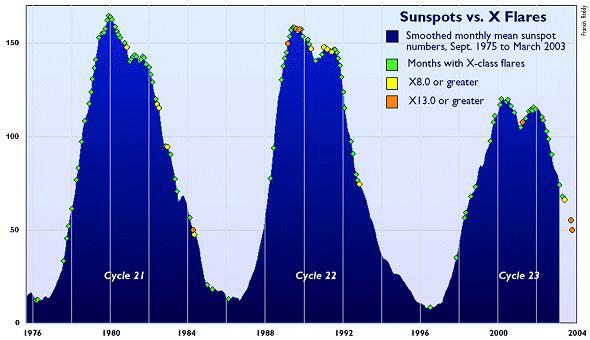 Sunspot counts were plunging, and the sun was rapidly approaching the 1985-86 solar minimum. Suddenly a giant sunspot appeared, Jupiter-sized like sunspot 486, and unleashed two dozen M-flares and three X-flares, including a remarkable flare registering X13. People then probably wondered too if the solar cycle was broken. "It's hard to be sure what's normal and what's not," notes Hathaway. "Astronomers have been observing x-rays from the sun for only 35 years--or three solar cycles. We can't draw good statistical conclusions from so few data." One thing is certain, though: flurries of solar activity can happen at any time. The next time, says Hathaway, could be just a week or so away. Sunspot 486 and its companions are on the far side of the sun now, carried around by the sun's 27-day rotation. "We suspect they're still active," says Hathaway, because the Solar and Heliospheric Observatory--a sun-watching satellite--has photographed clouds of gas being thrown over the sun's limb by unseen explosions. Unless these sunspots dissipate, which could happen, they will reappear on the Earth-facing side of the sun beginning as early as Nov. 14th. And then...? No one knows. "We might get some more unseasonal space weather," says Hathaway. But this time he won't be surprised.